Store explorer: J. Toguri Mercantile Co.
Worldwide icon-chevron-right North America icon-chevron-right United States icon-chevron-right Illinois icon-chevron-right Chicago icon-chevron-right Store explorer: J. Toguri Mercantile Co.
A Japanese marketplace inspires textile artist Danny Mansmith. DANNY BOY Mansmith is man enough for a parasol. The sculptor and textile artist doesn’t shop in art-supply stores; he finds his inspiration elsewhere, such as inside J. Toguri Mercantile Co. 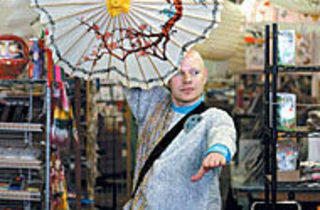 Founded shortly after World War II, the East Asian–import store is now run by the grandchildren of its original owner. “I come here to find raw materials. It’s my art store,” says Mansmith, who grew up in Chicago Heights and was largely raised by his grandmother. 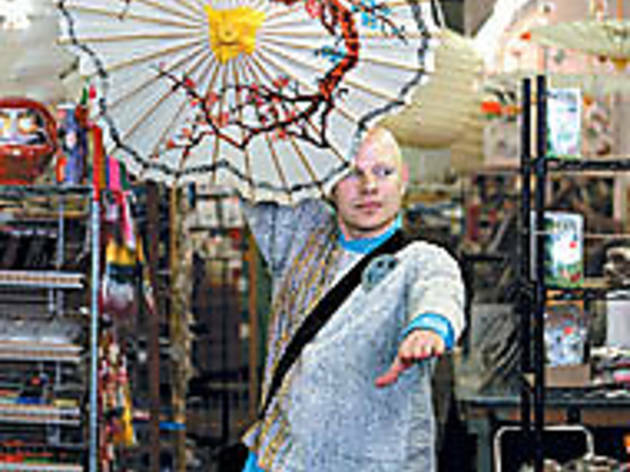 He strolls unobtrusively through the aisles—well, as unobtrusive as he can be, dressed entirely in clothes he sewed or dyed himself, including a large brooch that he made by covering origami paper (purchased on an earlier trip to Toguri) with plastic. As he browses the small food section, he’s drawn to a bizarre package decorated with cartoon trees; inside the clear plastic window, the mysterious contents appear to be freeze-dried cotton candy. Turns out it’s dried finely shredded codfish. “That’s a must,” he declares of the codfish, “just because it’s such a bizarre combination. It’s not our sensibility. The hot-pink trees just drew me to it. I’ll incorporate this into some sort of sculpture. I’ll sew it onto something because it’s an interesting juxtaposition: shiny and plastic next to fabric. Say konnichiwa to J. Toguri Mercantile Co. at 851 W Belmont Ave (773-929-3500). For information on Scrap, Mansmith’s studio, visit scrap-dannymansmith.squarespace.com. 1 “Not many men will say, ‘I love a good teapot!’ That’s the grandma in me; the shape is really beautiful.” Tea infuser, $5. 2 “This is obvious. I love paper and making paper sculptures, and that’s what this is.” Cut and Make Japanese Masks book, $9. 3 “A human actually put the stitches through this. It’s a really simple cotton, but they made it beautiful with the stitching.” Kendo shirt, $60. 4 “The faux alligator paper is unique, and it’s crazy because it’s made to look like a hide.” Origami paper, $10.